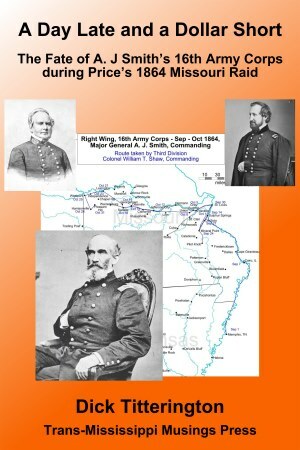 Many years ago when I began researching Price’s 1864 Missouri Raid, I was bemused by the role of Andrew Jackson Smith. A Major General of Federal Volunteers, A. J. Smith was on his way east to join Major General William T. Sherman’s Atlanta campaign. En route, Smith, his two divisions of infantry and a cavalry brigade were diverted to Missouri to reinforce the Federal commander there, Major General William S. Rosecrans. Based on what I had read in secondary sources, I came away with the impression that Smith’s command had chased Price across Missouri, but never caught up with him. My initial conclusion was Smith had failed in his mission to bring Price to battle and destroy his army. Well, as everyone probably already knows, it was a bit more complicated than that. During the first three years of the American Civil War, A. J. Smith earned the respect of three key commanders, Henry W. Halleck, Ulysses S. Grant, and William T. Sherman. Such was their respect for A. J. Smith, they usually just gave him an assignment and “let him work it out in his own way.” It seems they were never disappointed. Which is another reason why A. J. Smith’s role in the 1864 Missouri cavalry raid is so intriguing. So I decided to dig into the record of Major General A. J. Smith and the Right Wing of the 16th Army Corps. I wanted to understand better the events that sent him to Missouri. How did Smith end up in Missouri? Who decided to divert Smith to Missouri? Why did he fail to catch up with Price? Did he fail to meet his assigned objectives? I wrote this book to answer these questions to my satisfaction.